If you're in the in the accumulation phase then that positive cash flow allows you to save and invest to build up your future cash flow. If you're already retired, or FIREd, then congratulations because I'm sure your cash flow is well above what you need. We've been fairly lax in regards to our budgeting, but the time is right to really get things moving forward. One of our big goals for 2018 is to focus on our monthly spending. When it comes to personal finance it's rather simple income - expenses = savings and savings x investing = financial independence. There's obviously two main levers there and while we'd all like to increase our income, many times reducing expenses is some of the low hanging fruit that you can go after to increase your savings. May saw a continuation solid income with $9,031.82 for the month. My expenses climbed up to $3,320.77, but that was due to a trip that I took to Las Vegas with some friends of mine. Airfare isn't free. Without the travel expense during May total expenses would have dipped back below $3k. Despite the increase in expenses income more than made up for it allowing the savings rate to hold steady during May. Based on total income (pre & post tax work income, taxable dividends, interest) I had a solid 63% savings rate during May. Based on work income alone the savings rate was a solid 62%. *A few notes about the budget check. All income is only income that I receive and does not include my wife's income likewise for the expenses. We've found it's easiest for us to just keep separate accounts since I'm gone most of the time for work. Also, pre-tax withholding for the 401k (I currently withhold 6% in order to get the full 5% employer match) and the ESPP through my employer (8% post tax withholding) are not included in the above savings amount. 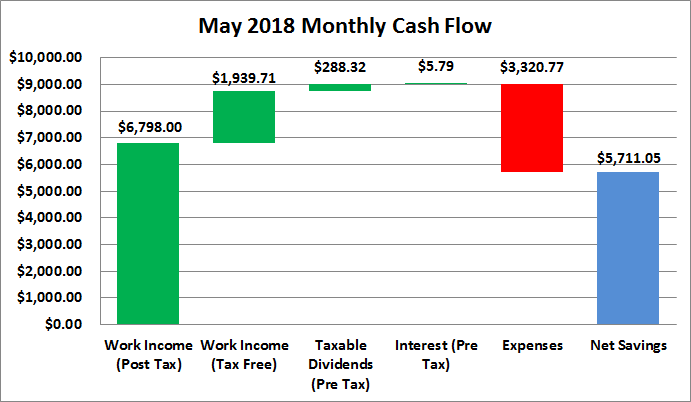 Truly passive income, dividends and interest, totaled $294.11 during May which was about a $10 increase from February. *Dividends are from my taxable accounts only. Based on May's spending the passive income for May covered 9% of expenses. Thus far in 2018 I've totaled $2,208.84 from income outside a traditional day job. We're already half way through June now which is hard to believe. If you recall my plan was to build up $10k of cash plus enough cash to cover our vacation in July and then we'll swap to aggressive debt reduction. We're likely still another month away from getting to that point, but I can see it coming on the horizon. If everything goes absolutely perfect there's an outside chance that we can be rid of the non-mortgage debt near the end of Q3, although if we can be rid of it by the end of 2018 I'll be just has happy. There's 2 main debts, my wife's car and our air conditioner for the house and getting rid of those 2 debts will free up around $850 of monthly cash flow. So needless to say I'm pretty stoked that we'll be getting that reduced soon. There's still plenty of room for improvement to reduce expenses which will make the math look even better. Food expenses continue to be higher than I'd like, but that is improving as I've started cooking a lot more while at work. The other low hanging fruit is our insurance which I hope to take care of the next time I'm home. How is your monthly cash flow situation? What are you doing to increase your savings? 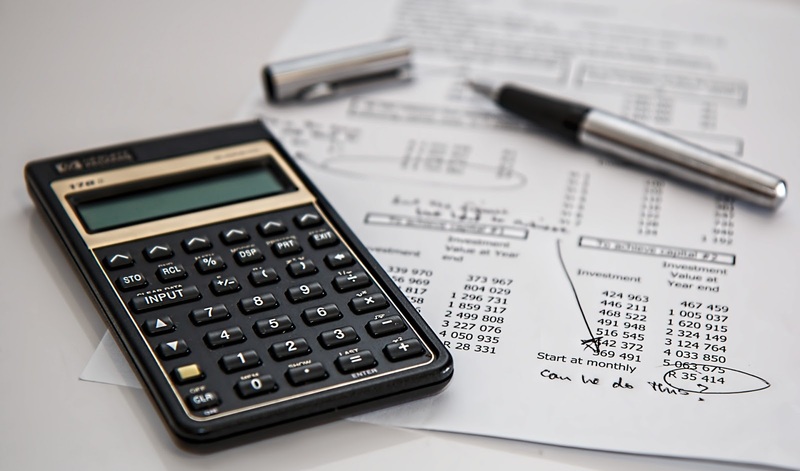 Are you focusing more on increasing income or reducing expenses? There's still some more work to be done to get our expenses down but overall I can't really complain. Even better is when we really start hammering away at the debt to get rid of that. Freeing up around $850 of monthly cash flow to then put towards investing once again will be huge. I can't wait to have the potential for $3-6k going straight into the investment accounts once again.